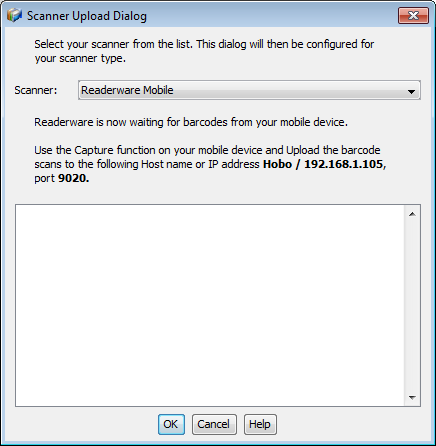 Readerware Mobile lets you use the camera on your smart phone or tablet as a barcode scanner and capture ISBNs and UPCs. You can also enter the ISBN if a book does not have a barcode. You now have a list of ISBNs on your mobile device, how do you use these with Readerware auto-catalog? Readerware is now ready to receive your barcodes. 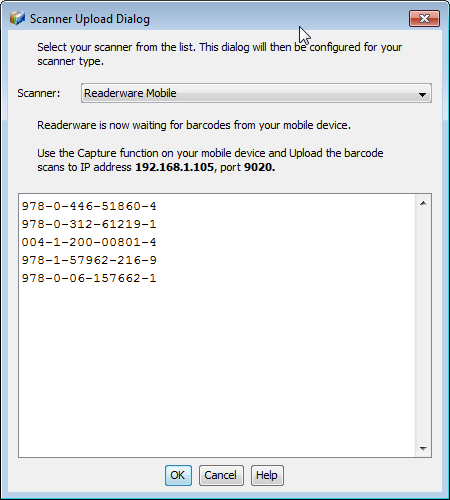 Notice that Readerware displays the name of your computer, your IP address and port number, you will use these with Readerware Mobile to send the scans. On Readerware Mobile ensure that your device is connected to your home WiFi network, touch the Upload button and enter the name or IP address and the port number displayed. Using the computer name is preferred as this will not change. Only use the IP address if the computer name cannot be resolved. You can now continue with auto-catalog as normal and add your books to your database. Note that you can upload into any Readerware wizard that accepts a list of ISBNs, Readerware auto-catalog, auto-update and the bulk editor.